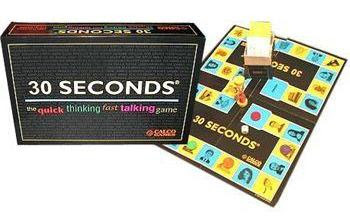 "30 Seconds". Most South Africans will know this board game. I'm not sure if it's sold in other countries, but I know in the States they have a similar game called Taboo. Basically, you will be in teams of two or more. One of your teammates will pick up a card that has five words on it. Your teammates need to say as many of these words as possible, in 30 seconds, but the person with the card can not say these words themselves. So you have to explain the words to your teammates, or use charades, or whatever you can to make them say those words. Me: "That episode where Monica is upset because she ordered videos for her ex boyfriend Richard and it was delivered after they broke up. What videos were those of?" Best friend: "The Civil War". Needless to say, no one wanted to play with us. I love board games, and some of my other favorites are Monopoly, Cluedo and Pictionary. Do you like playing board games? Which one is your favorite? I used to LOVE playing Disney Monopoly.